1) FreeSync on an AMD GPU and G-SYNC on an Nvidia GPU on this monitor have virtually the same input lag with an appropriate FPS limit. 2) While 138 FPS was enough to keep both FreeSync & G-SYNC in the VRR range with the V-SYNC option disabled, he witnessed bottom screen tearing (which again, is normal due to rapid frametime variances in the upper FPS range with VRR + V-SYNC "Off") until he either lowered the FPS limit to around 110 (again, this number can vary depending on the max refresh rate, as well as the accuracy of the given FPS limiter), or enabled the V-SYNC option (with a 138 FPS cap). 3) 138 FPS + VRR + V-SYNC option on, results in no tearing in the upper FPS range, and virtually no input lag increase over 138 FPS + VRR + V-SYNC option off (as expected). So there you have it, the upper VRR range on an officially Nvidia supported FreeSync monitor, "G-SYNC on FreeSync" is working properly/as expected with an appropriate FPS limit with either the V-SYNC option off (bottom tearing) or on (no tearing). Obviously, he didn't test the lower range, so LFC functionality is still up in the air, but it's good to have some of these details confirmed, at least for best case scenario when using this new feature. On the two monitors I have tested, they require a 100fps limit to eliminate all tearing without VSync enabled. I'm looking for people with AMD GPUs and FreeSync monitors to repeat this test, as well as people with real official G-Sync monitors with Nvidia GPUs. It would be very interesting to see where the break limit is for each scenario - how much of a frame limit do you need to stay within sync range? But yes, that behavior is expected. The required FPS limit also depends on your maximum refresh rate, and the overall frametime performance of the system in combo with the specific game. At 144Hz, I've found that the tearing near the bottom of the screen due to frametime variances in the upper VRR range disappears at around 120 FPS (@144Hz) on a G-SYNC monitor containing a module. It's very possible the "G-SYNC Compatible" driver implementation isn't as accurate as the module (or even standalone FreeSync with an AMD GPU) currently, thus the need for a lower FPS limit to see the same tearing reduction/removal with G-SYNC + V-SYNC "Off." To be clear, however, this tearing near the bottom of the screen is your literal input lag reduction; at any point you don't see the tearing, it's virtually no different input lag-wise than what you'd get with G-SYNC + V-SYNC "On" + a higher FPS limit. So generally, there is usually little reason to use it over G-SYNC + V-SYNC "On" + appropriate FPS limit @144Hz. In fact, technically speaking, with G-SYNC + V-SYNC "Off" + 100 FPS limit @144Hz, you're getting more potential input lag than the above scenario due to higher sustained frametimes (10ms render time per frame vs. 7.1ms). jorimt wrote: At 144Hz, I've found that the tearing near the bottom of the screen due to frametime variances in the upper VRR range disappears at around 120 FPS (@144Hz) on a G-SYNC monitor containing a module. Very good to know! I wonder what the technical differences are that make the G-Sync official implementation work better. And if possibly Nvidia could improve their FreeSync/Adaptive Sync implementation in software to make it better. jorimt wrote: In fact, technically speaking, with G-SYNC + V-SYNC "Off" + 100 FPS limit @144Hz, you're getting more potential input lag than the above scenario due to higher sustained frametimes (10ms render time per frame vs. 7.1ms). Yeah I was thinking the same thing. Would be interesting to have someone do an input lag test with each scenario and see which is best. Even at just -2 FPS below refresh rate, averages at 142 FPS/144Hz are very close between G-SYNC + V-SYNC, G-SYNC + V-SYNC off, and V-SYNC off (G-SYNC off and V-SYNC off). Middle screen readings would be virtually the same between all scenarios (I did "first reaction" method, read more about my testing methodology here: https://www.blurbusters.com/gsync/gsync ... ettings/3/). Battle(non)sense just recently did a video (see my post above your original), and findings were about the same between those scenarios with "G-SYNC Compatible" on an officially supported FreeSync monitor. The only thing that isn't known for certain at this point is whether "G-SYNC Compatible" mode needs anything lower than -3 FPS limit to stay within the VRR range on every FreeSync monitor that supports it, and if so, by how much. Battle(non)sense's officially supported Freesync monitor was tested with an 138 FPS limit, which was sufficient at keeping it in the VRR range for both G-SYNC + V-SYNC on/off. Yes, he needed a 110 FPS limit to remove tearing in the lower part of the screen with G-SYNC + V-SYNC "Off," but this wasn't for the direct purpose of keeping it in the VRR range; by 138 FPS, it already was. 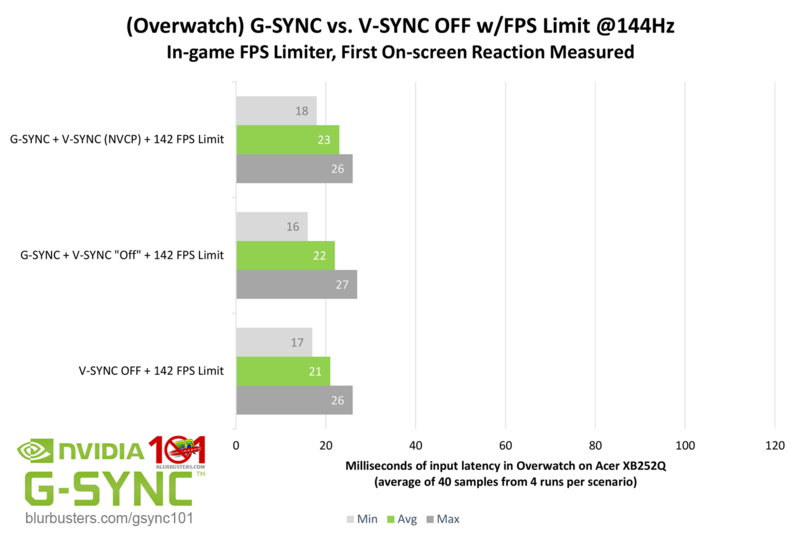 Again, V-SYNC "On" with G-SYNC is to account for frametime variances (fully remove tearing) while avoiding the need for a much lower FPS limit. I wish there was a way you could see exactly when Sync gets activated, like some sort of flag, so you'd always know when you are in or out of the range. I tried an option in the Nvidia control panel to show Gsync Compatible Indicator, but it just shows an always on indicator for whenever a 3D program is running instead of turning it off and on when it goes in and out of range. One more input lag test you could do is comparing 120fps locked Gsync On Vsync Off vs 142fps locked Gsync On Vsync On. Jesse Durden wrote: I wish there was a way you could see exactly when Sync gets activated, like some sort of flag, so you'd always know when you are in or out of the range. Some monitors have a built-in refresh rate meter that shows just that (fluctuating means in range, static max refresh rate reading means out of range), but even they aren't 100% accurate (you need a high speed camera setup to tell for certain). Also, with a G-SYNC module, you're only "out" of the range without a framerate limit + framerates above the refresh rate. Due to LFC (aka "low framerate compensation," a more commonly used term for this, coined by AMD originally), it can't really drop "out" of the lower range, and thanks to what Nvidia calls "frame doubling" (and what I call the "Minimum Refresh Range" in my article, and what AMD calls "LFC;" sheesh), the VRR range (on a genuine G-SYNC monitor) effectively goes from max refresh rate all the way down to 1 FPS. It should be a similar case with higher native refresh range, LFC-supported FreeSync monitor's paired with an Nvidia GPU w/G-SYNC Compatible mode, or an AMD GPU w/FreeSync mode. But yes, for FreeSync monitors that don't support (or fully support) LFC, you can effectively drop out of the VRR range when the framerate goes either too low or too high. Jesse Durden wrote: One more input lag test you could do is comparing 120fps locked Gsync On Vsync Off vs 142fps locked Gsync On Vsync On. I don't need to; I can guarantee it would be nearly identical to the G-SYNC + V-SYNC "Off" + 142 FPS @144Hz scenario (or just slightly more even with the G-SYNC + V-SYNC "On" + 142 FPS Limit scenario) shown in the chart of my previous post. The frametime differences between the two framerates (120 FPS at 8.3ms per, and 142 FPS at 7ms per) just isn't enough to cause a perceivable input lag difference in this situation, especially in instances where that combination (regardless of FPS limit) is allowed to tear instead of sync. I think I found the reason why I feel added Input Lag when I activate this driver Gsync (not talking about module monitors). I have a lot of monitors as you know, and I´m still waiting for my MSI Optix MAG241C again (don´t have it for 1 week but will come tomorrow or in 2 days at best) just to confirm my "theory". I started to notice I really notice the added Gsync Input lag with my Asus models. Asus XG248Q 240hz, Asus XG258Q 240hz, Asus MG248QR. On Samsung CFG73 the input lag actually seems to decrease. Then I started my own research and I found this. Rtings has a way to test monitor input lag when VRR is enabled. Every Asus monitor tested at Rtings with VRR shown an increase in input lag when VRR is ON. Asus VG245H, PG279QZ, PG279Q, PG348Q. For example PG279QZ shows 4,4ms without any VRR and 4,9ms with VRR. ViewSonic XG2402 is 4,1ms without VRR and Asus VG248Q is 5,2ms without VRR and I can clearly notice how XG2402 is faster, so I guess 0,5ms difference on Rtings methodology is enough for me to spot the difference? CHG70 with VRR is 4,2ms, without is 4,4ms. So lower input lag with VRR. MSI Optix is 5,3ms without VRR, and only 4,3ms (1ms less) with VRR. Checking the other models they usually review, only Asus and Benq models appeared to show this behaviour, where input lag increases once you use Gsync. I can´t say this applies to every Asus model, but it certainly do on all the Asus I have around here, and this might explain why I notice input lag increase on the Asus models, while on the Samsung I don´t notice anything. And on the Optix line it might even reduce it further. So this might be an Asus or TN panelrelated thing? While on VA Samsung FreeSync actually reduces signal latency? So effectively, VRR input lag varies amongst monitors because they have different input lag values, depending on wether you are using VRR or not. Rtings tests clearly show us this! Notty_PT wrote: VRR input lag varies amongst monitors because they have different input lag values, depending on wether you are using VRR or not. Rtings tests clearly show us this! The only results repeatable across G-SYNC monitors and systems when we're talking about input lag, is the direct difference between G-SYNC and other syncing modes (or lack thereof) when they are tested on the same monitor with the same system. E.g. G-SYNC has "x" more/less lag than "x" setting using "x" monitor with "x" system. Beyond that, the actual input lag numbers themselves are all relative to the given panel type, monitor processing, and max refresh rate, as well as given system's ability (or inability) to deliver frames to the monitor. So, for instance, one person's G-SYNC monitor + system may have higher/lower overall input lag than another person's, but the direct input lag difference between G-SYNC and other syncing modes on each of their setups will be about the same. As for Rtings showing an input lag difference between VRR/non-VRR for some monitors, they are taking middle screen readings for both non-VRR and VRR operation with their tool, so it's possible the results that are within a millisecond (or less) of each other are simply within margin of error. In that case I have no idea why I notice the input lag increase on all of my Asus monitors when I enable VRR. I may give up trying to find out why at this point lol. But it totally doesn´t happen on the Samsung CFG73 and I´m waiting on my MSi Optix MAG241C to see what happens.